Installing a set of brand new garage doors instantly boosts the curb appeal of your home and increases the value of your property. Garage doors are seen as a home necessity today – not only do they need to be fully functional, but they also need to be visually appealing. Luckily, garage doors now come in a wide variety of styles and prices so that you can find the best option for your home. The CSS installation process starts with a complete tear-down (if necessary) of the existing garage door, then installing a full range of quality lifting technology and hardware like tracks, nylon rollers, and operator brackets. Finally, we connect the garage door opener, and now the new addition to your home is complete. a garage door opener and an actual garage door. With decades of experience in the industry, our team has found which products and brands are the most reliable for your home. We have found that the majority of garage door fails come from two major factors; careless installation, and poorly designed low quality parts. We guarantee our work, but we also put great thought and attention to the products we use. We have a commitment to bringing you the best products available. Material: Most garage doors built today are made of steel, but there are other options available if you are looking for a specialty door. Style: Raised panel and stamped carriage garage doors are both popular styles designed to look good on almost any home. You can also consider a custom garage door if you want to make it create a dramatic entrance point to the face of your house. With a wide variety of products to choose from, our goal is to simplify the selection process by focusing on the best solutions that fit your interests. Insulation: Insulated garage doors are designed to maintain the same internal temperature as your home. They might cost more, but they save you money on monthly power bills. 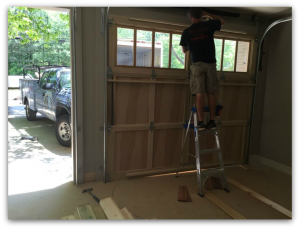 A door’s “R-Value” explains how good it is at insulating the garage from external temperatures (the higher the R-value, the more insulation it offers). 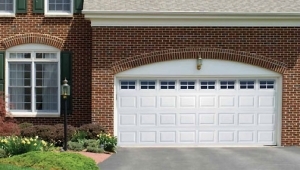 Raised Panel Garage Doors are a great option for homeowners looking for a basic garage door. Being the lowest cost option available, they have good pattern detail and enough design choices to allow you to create a distinct look. All garage door manufacturers offer similar looking raised panel model, so we look for providers that have the highest standards in quality and durability. Stamped Carriage Garage Doors have become immensely popular in the last decade by providing more detail and a lot of charm. The stamped carriage doors are surprisingly cost effective way to create an elegant carriage appearance, because they are constructed like the raised panel doors, but are outfitted with an elegant carriage appearance. 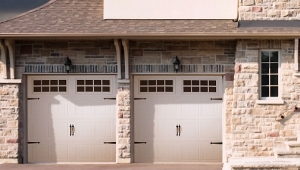 Custom garage doors can give you a truly unique look that will highlight the beauty of your home. 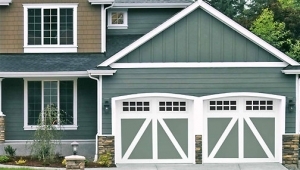 With a signature craftsman appearance, a custom garage door will accentuate the details and colors of your home. You have many material combinations and style techniques that will allow you to personalize your door. We categorize most custom doors as overlay or faux finish. 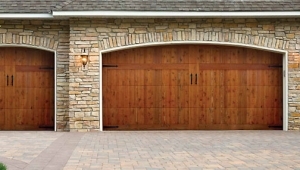 From street-view, these garage doors are indistinguishable from hardwood garage doors, but offer the durability and resilience of a metal frame. They even have luxurious finishes like oak, cedar, and mahogany. With specially crafted additional materials, these models are complete with sophisticated arches and crossbeams for a country or old world appearance. Multiple layers can be added for special grooves along the edges and two-tone paint finishes provide eye-catching colors to the already stunning door. These models are best for customers that want their garage door to be a focal point of their home’s curb appeal. The overlaid features are designed and fastened by the companies we buy from – so they come complete with a manufacturer’s warranty.